At Quality Air Heating and Air Conditioning, we pride ourselves on getting any job done right the first time, and providing all of our customers with the friendliest services available. When you contact us to arrange for heating or air conditioning services, you’ll always get to speak to a live person, not a machine. You can trust us to reach you fast and be ready to go to work. From repairing gas furnaces to new installs of air conditioning systems, we handle it all in Franklin County, OH. And if you’re a business owner in the area, ask about our great commercial HVAC services. Call the professionals at Quality Air Heating and Air Conditioning for a perfect comfort solution! Are You Looking for Quality Heating for Your Home? If so, then you won’t have to look any farther: just call on Quality Air Heating and Air Conditioning. We have 24-hour emergency service for when your valuable residential heater breaks down on a cold day. But we’re also glad to help with many other scheduled services, such as regular maintenance that will keep your heater dependable, and full installations and replacements to bring a fantastic new heating system into your house. As a resident of Franklin County, OH, you’ll have a hard time finding more customer-friendly service than ours. Furnaces: they simply are the most popular way to keep a home warm no matter how low the outdoor temperature may plunge. Our technicians are experienced with working on electric and gas furnaces, and they will help you select the right model to keep your home warm when you are looking for a replacement or a new unit. Keep our number handy for whenever your furnace needs quality repairs. The newer models of heat pumps have overcome the faults of older units that often failed to deliver adequate heating during extremely chilly weather. We install top quality heat pumps that will watch over your family’s comfort throughout the year, and we repair and maintain them as well. Don’t hesitate if you’re in need of heat pump service: our operators are standing by! The heavy insulation on our homes means that there’s little opportunity for fresh air to come in and sweep out the bad air, especially in winter. We want to help you enjoy healthy air all year long, which is why we provide indoor air quality services. Contact us to find out more about the variety of solutions that we offer to clean your home’s air and balance its humidity. Are You In Need of Humidifiers or Dehumidifiers? Maintaining the right balance of humidity indoors (30%-40%) is essential for enjoying a comfortable and healthy home. If your indoor air tilts too much one way or the other during the different seasons, let us take care of the problem. We provide installation, repair, and maintenance services for many of the best whole-house humidifiers and dehumidifiers. While air filters passively trap contaminants that attempt to flow through their mesh of fibers, air purifiers are more active. A common type of air purifier uses electrical ionization to change the charge of particles flowing through your HVAC system and then drawing them out of your air. Our specialists will see that you are matched with the right model of air purifier for your needs. A hot and humid summer in Franklin County can be incredibly unpleasant if you have a weak and undersized air conditioner in your home-or worse, no air conditioner at all! Let Quality Air Heating and Air Conditioning solve any AC troubles you may have, starting with installing a great new system or replacing the aging one that is failing at its job. (Of course we can repair it if the system is still young.) We also recommend that you enroll in one of our maintenance plans to see that your air conditioner continues to work at peak condition for many years to come. There’s a good reason that we provide 24-hour emergency service and always have our phones staffed. We know that a broken air conditioner or one that’s not working the way it should is a serious problem during a sweltering summer. We’ll be right out to you to solve the problem with our AC expertise. You can always schedule less pressing repairs with us as well-you’ll still get the same great service. You cannot turn to just any heating and air conditioning company if you’re looking for HVAC services for your business. This job requires specialists who have training and experience on complex devices like commercial rooftop units. 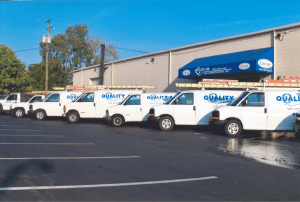 Quality Air Heating and Air Conditioning is more than up to the task of keeping your business in Franklin County cool in summer and warm in winter. See that your employees, customers, clients, tenants, etc. have no reason to complain about comfort: give us a call the next time you require any type of commercial HVAC service. Are you experiencing trouble with your business’s heating or cooling system, and it’s having a negative effect on day-to-day operations? Pick up the phone, call our number, and relax knowing that you are in the best hands! We fix all types of commercial units, such as package and rooftop air conditioners and heaters. We will treat your business with the respect that it deserves.